A Joplin Globe article described the enthusiasm of the boys to partake in its cool, wet relief, “The youngsters did not disrobe before entering; such a move would have brought down upon them the wrath of the law. 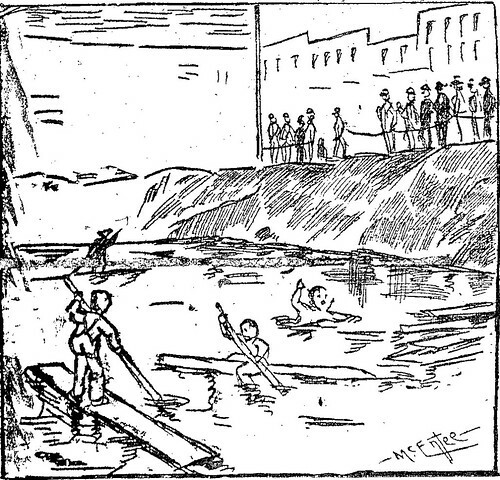 They simply plunged in, clothes and all, a very few of them removing their outer shirts before the plunge.” In addition to the swimming and diving, the boys soon discovered wooden boards that were quickly plied into use as rafts. Envious youthful onlookers, who had failed to secure such craft when the opportunity allowed, willingly paid several cents, upward to a dime, to purchase either a ride on a raft or a raft itself. The fun and games did not last forever, at least for a boy named Robert. His aquatic fun ended upon the discovery of his mother of finding her son, fully clothed, splashing about the rain-filled pit. The last that was seen of poor Robert was his mother leading him away with a firm grip on his ear. Love this story!… and this site!